It would seem that the original Wild Cat, as found in early historical times as well as in the Middle Ages, has for a long time been quite extinct in this country, its place being taken in the first instance by a mixed breed, in which the hereditary strain of the original wild race predominated. Later on, as the imported race increased in numbers and localities, this was superseded by a still more modified form of feral cat, in which the foreign characteristics of the ancestral progenitors of the domestic race, viz. the African cat, were in the ascendant, and prevail up to the present time. At the present time, after so many hundred years of the interbreeding of the two races, it is very difficult to determine the difference between these feral cats and the Felis catus as it existed in medaeval times. As far as my observations go, the chief distinctions are the form of the skull, and the general colour and markings of the fur. 1. 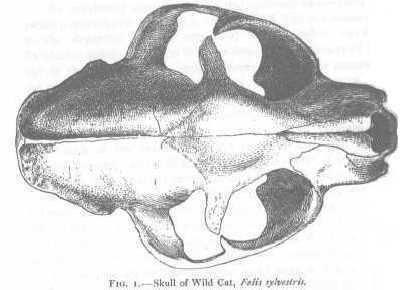 In the true Wild Cat of earlier days, the skull is long and narrow. The frontal bones are narrow, depressed, and concave in the centre. The cranium is compressed and elongated. The occipital ridge is jagged and thick. The sagittal ridge, extending sometimes as far as the coronal suture, generally about half way. All the bones of the skull are thick and firmly welded together. The basal length is from 85 to 90 mm., and the breadth over parietals is 44 to 47 mm. See Fig. No. 1. 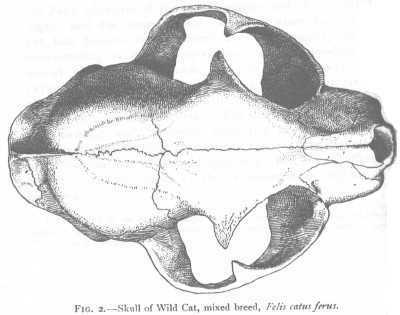 In the feral of Wild Cat of the present day in Scotland, the skull is short and broad, the cranium round and bulging. The frontal bones are broad, convex, or flat. The occipital ridge is thin and less jagged. The saggittal ridge is short or altogether absent. The bones of the skull are comparatively thin and less firm than in the true Wild Cat. The basal length is 78 to 84 mm., and the breadth over parietals 47 to 53 mm. See Fig. No. 2. 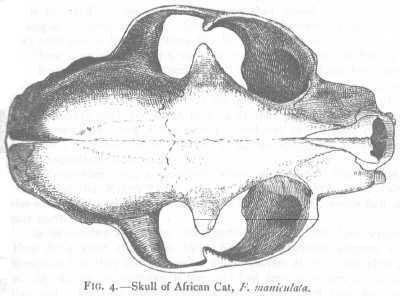 In the skull of the African cat (F. maniculata), Fig. 4, the frontal bones and cranium approximate to the same parts in Fig. 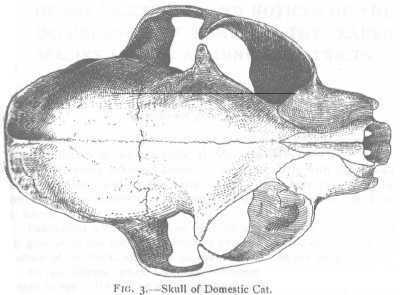 A, while the same parts in the skull of the domestic cat, Fig 3, come nearer to those bones in Fig 2.